Relationship: The Last Man To Talk With Him - A Grateful Brother. 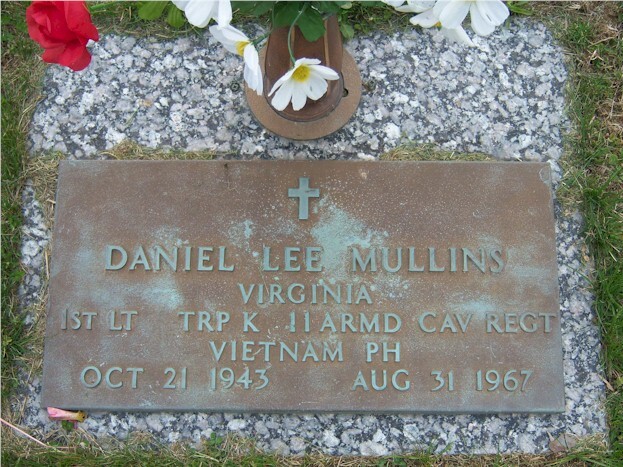 I served with Lt.Mullins right up to the day he was killed. In fact, I was standing next to him just before the mine went off that took his life. I was the last person to talk to him. He was a very brave soldier, and cared dearly for the men under him. In the ambush at Soui Cat, my PC was disabled as we left the base camp. I was a spare man in the last PC not to get hit in the ambush, and watched the whole thing take place. We all have our memories, and mine differ from what I have read of that day. The lead units had just started to turn in to the clearing, which was known as slope 30. The lieutenant sent myself, Al Heller, the sarge Jack?, and the new man into secure the kill zone. The sarge and Heller, worked their way to the end of the column. On the way in I opened fire on five VC. I saw off to my right, they went down. Two came back up and fired back at me, and I emptied another clip and they went down. There were two PCs down and a tank that I saw take 13 RPG hits off into the edge of the jungle on the left side of the road. Then there was a diesel truck, with its tires shot out. Directly across from the end of the truck was a trail leading into the bush. Myself and the new man, laid down on the ground, on the edge of the road to hold this position. As I looked over the grass in front of me, a .50 caliber opened up and hit the dirt about an inch from my left ear, and walked a line across the road. I knew we were in trouble, and told the new guy to make it to the back of the truck for cover. I came up backing towards the rear of the truck, laying down a spray of fire to cover our move. After flipping my clip, I came out from behind the truck, and sprayed another clip down the trail. Just as I fired, I saw an RPG fire and was heading right at me. Lt. Mullins came charging down the road and came between me and the rocket. It hit the side of his track and blew the track off, but I have no doubt, he saved my life that day. He then sent me to the rear of the kill zone, as there was still a lot of firing going on. After this, we set up our perimeter in the clearing at the foot of Gia Ray, also known as Slope 30. I could see where the VC bodies were buried from my location. My position that night on the perimeter was two PCs from the right of the tank facing up the clearing. To my left was Jim Brigman and the Chief. About midnight, as I was on the .50, I smelled what smelled like someone had just sprayed a huge mist of perfume. I later realized it was the smell of opium. Then after hearing shots out in front of my position, where our patrol was, two rounds hit Jim and the chiefs PC, blowing them both out of it. All I remember was firing the fifty in a spray pattern, back and forth into the VC trying to penetrate the wire. Every time a flare would go off, all I remember seeing were VC, coming as far as I could see. They made it through the first layer of wire, and were almost up to the point of penetrating the last barrier of wire, when I heard the choppers coming in the distance. They did to, because they vanished into the night as suddenly as they had appeared. At this point, Lt. Mullins told me to follow his PC, and we left the perimeter, and went out after our patrol. We waited till light if I remember correctly to return. So I never did find out the final tally of casualties from that night. On the day that Lt. Mullins was killed, I remember we had just sat down for breakfast in the mess hall at base camp, one of the very few times I remember ever eating in it. Lt. Mullins came rushing in and told K-Troop, to mount up as one of our PCs had hit a five 500 pound tank mine just down the road from the camp. It was on its way back off patrol. We headed out and set up around the area. The PC was burned pretty bad but they said no one was killed. There was a large hole in the road and Lt. Mullins told me to come with him to guide any traffic around the hole. I remember there was a deuce and a half that came up the road from the direction of Xuan Loc. It stooped about ten feet from the hole, and Lt. Mullins and I was standing beside each other, riight next to the door of the truck. The engineers were coming out to pick up the PC and there was an MP jeep in the lead. The lieutenant said I could go back to my PC, and I turned and took two steps when another mine went off. It lifted me straight up into the air about 15 ft. off the ground. As I looked over my shoulder I was being hit with chunks of burning debris. I watched the lieutenant, the MP lieutenant, the sergeant driver, all in the air, near the top of the rubber trees, along with all the dirt cloud under them. After what seemed like slow motion, everything came back down with a thud. I ran around the front of the truck and the only other one to survive was the corporal. He had lost both legs and was asking me what happened to his mates. The medics came running and took over putting the tourniquets in place. I then ran around the truck looking for Lt. Mullins. He was face down in the gully on the other side of the truck. He had taken a piece of shrapnel through the side of the temple that came out the other side but he was still alive. By this time a chopper had landed in the road directly behind the truck. Harold Fremd and I put the lieutenant on his poncho and ran him to the chopper, along with the corporal. The other lieutenant and the sergeant were face down in the road. I rode with Lt. Mullins as his driver. I only knew him for a short time but liked and respected him. He was a good officer, followed orders, did his duty and more. He took care of his people. I'd be proud to camp with him again someday on Fiddlers Green.